As I've grown older, I have come to accept many things. I will never, for example, be a concert pianist. Or an Olympic swimmer. And dreams of tap dancing in stage musicals, fell by the wayside years ago. So, I am unsure as to why I suffer certain delusions when it comes to handicrafts. Let's take this project for example. 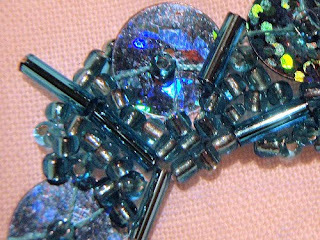 My eagerness to produce something delicate and sparkly for a swap has led me to overlook a number of facts. Sequins and beads are teeny tiny. I am long-sighted and have sausage fingers. On the face of it, bugle beads and a lack of manual dexterity do appear mutually exclusive. Let's see what happens. If the beading is successful, maybe my next stop will be an audition to tread the boards in 42nd Street? wear reading glasses. I've heard of folk wearing 2 pair, one atop the other even ! Also, I know zero about beading myself, but I have heard that the sticky side of a post-it is good for holding them down to get your needle inside. Shine up thos tap shoes. I suffer from the same afflictions! I am with Tania- I hoep busy doesn't want to do anythign invloving me having to sew beads- so fiddley. And then you drop thelast one and can't find it anywhere .... Not much longer till the next olypics , go for it ! Can I pre-purchase tickets for your 42nd street performance? 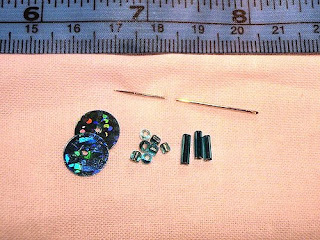 Yes, those tiny holes are the reason most of us dedicated beaders scoop up the beads with the needle whenever possible. It's easiest to do if the beads are on a slightly giving but not too slick surface, like felt or Vellux, although I've used craft foam as a surface inside a tray. A giggle: I was beading in public the other day when a woman came over and and said, "You must have so much patience, I can barely even see those beads!" Her face when I replied, "I can't really see them either" and scooped up another bead for the next stitch was priceless.